Having a bird bath heater makes both birds and bird watchers alike happy. 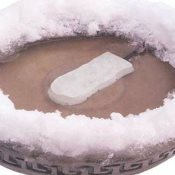 If you do not want to buy a heated bird bath all-in-one type unit that has a heater built-in because you already have a bird bath, you can get a de-icer to place on the bottom of the basin. Of course, the least expensive way is to go out every morning, break the ice and add fresh water until it freezes again - not easy, but cheap. So let's look at some less manual labor ways of keeping the water from freezing. 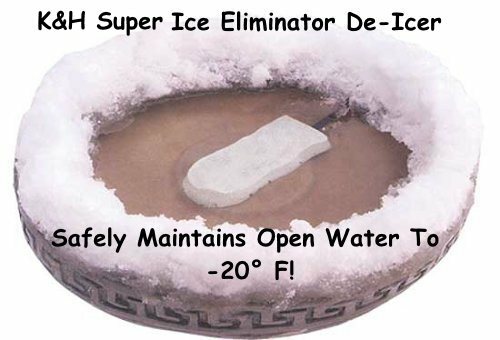 One of the best bird bath heater/de-icer is the K&H Super Ice Eliminator. They say you can spray paint it to any color you want although we don't think it would be necessary to do so. This customer photo shows that the bath is still mostly open with temperatures as low as -18° F! When choosing a bird bath heater, measure the width of the bottom of your bird bath where the de-icer will be placed to make sure it will fit. De-icers come in various sizes and shapes and some will fit better depending on your type of bird bath. 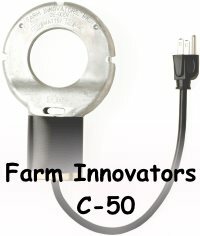 The Farm Innovators C-50 De-Icer is also a good choice. It runs at 150 watts vs 50 watts in the K&H which means it will costs 3x more to operate. The price is about the same as the K&H and they both are thermostatically controlled, so it just comes down to whether you want or need one that is more powerful. As already mentioned above, the K&H will keep water unfrozen up to -20 deg F, but if you live in even a colder area (wow!) then you may want to consider the Farm Innovators bird bath heater. Thermostatically Controlled Heaters - Saves Energy by turning on only when the temperature falls below freezing. 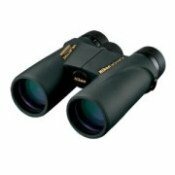 Wattage - 50 Watts is usually sufficient for most average sized bird baths in northern climates, but larger size and/or bird baths in extremely cold areas may require more. Note width of your bath and compare to heater size to make sure it will fit. 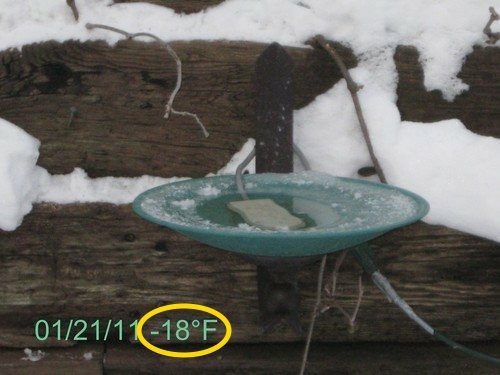 How Much Does It Cost To Run A Bird Bath Heater During The Winter? But if on average it costs 7-8 cents/kilowatt-hour, then to run a 50-watt heater it would cost about 10 cents/day or about $3/month. But that's if it runs non-stop, 24 hours a day. 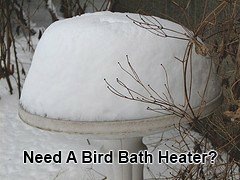 If you get a bird bath heater that is thermostatically controlled and only turns on when needed, then your cost can be as little as $1.50/month, less or more depending on temperature. 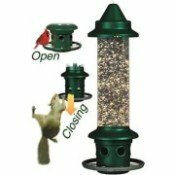 Since birds are not drinking during the night, you could set up a timer so the heater runs only during the day. Have it turn on just before dawn so that it melts any ice before birds arrive. What About A Solar Bird Bath Heater? We have not found a reliable solar bird bath heater on the market yet. The closest product is the Solar Sipper which is a bird bath, not just a heater, but it just doesn't perform like it should. We also would like to see a design for a wind-powered bird bath heater. When we find a good one - solar or wind-powered, we'll be sure to let you know. On a side note, we had a visitor who had hummingbirds visiting her feeder during cold months and to keep the nectar from freezing, she made up her own light-bulb contraption which can be seen here: Hummingbird Feeder Heater. Since I invested in a bird bath for my backyard birds, I wanted to have it available to use year-round, but living in a northern cold climate means the water needs to be heated or else it turns into a solid mass, a bird-bath ice rink, and birds want to drink not skate. So I'm glad I now have a heater to break-the-ice with the birds (pun intended ) and watch them joyfully sip and bathe on a cold, wintry day.